In 1983, Igor Butman played in Oleg Lundstrem`s big band - the best one in the USSR. Next year he was invited by Nick Levinovsky to join the most well known jazz group "Allegro" and played with them for three years. In the Soviet Union, a country of over 300 million people, Igor was known as the best tenor saxophonist, placing first in the Soviet Critics' Polls and recording many albums for Melodiya. After Igor Butman immigrated to America in 1987, he went on to major in Performance and Composition at Berklee College of Music in Massachusetts. By the time Igor arrived in the United States, he already had a "fan club" made up of some of America's most respected Jazz artists.In 1983, Igor Butman played in Oleg Lundstrem`s big band - the best one in the USSR. Next year he was invited by Nick Levinovsky to join the most well known jazz group "Allegro" and played with them for three years. In the Soviet Union, a country of over 300 million people, Igor was known as the best tenor saxophonist, placing first in the Soviet Critics' Polls and recording many albums for Melodiya. 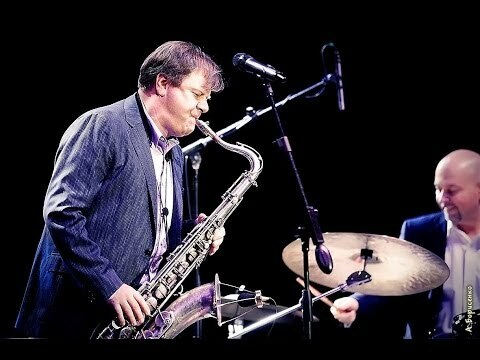 After Igor Butman immigrated to America in 1987, he went on to major in Performance and Composition at Berklee College of Music in Massachusetts. By the time Igor arrived in the United States, he already had a "fan club" made up of some of America's most respected Jazz artists. Igor's big sound and boyish exuberance have earned him standing ovations and many new fans, and his US solo career has moved straight ahead. He led his own group with Rachel Z. at Boston's leading Jazz club, The Regattabar, and has been featured soloist with the Billy Taylor Quartet, the Walter Davis Jr. Quartet and the Monty Alexander Quintet. He appeared on "The Today Show", "Good Morning America" and numerous other international programs. Fast forward to 2011, Igor Butman’s 50th anniversary concert featuring Wynton Marsalis, Natalie Cole, Billy Cobham and Christian McBride took place at 6000-seated Kremlin Palace in Moscow, the biggest venue of the country, and became one of the most important events in the history of Russian jazz, according to mass media! Igor has performed at every Olympic Games starting with Athens'2004 and he was among those who ensured Russian victory in running for the capital of Winter Games in 2014. Igor Butman runs international "AquaJazz" festival which is held annually in July in Sochi. On October 28, 2011 Igor Butman was given a rank of People's Artist of Russian Federation for outstanding services to Russian music by the decree of Russian President Dmitry Medvedev. Tell us what you think of Igor Butman Quintet, +support: Leon Greening Trio below..